esque protest album informed by a visit to Iraq. That Michael Franti is filed under hip-hop probably has more to do with his tenure in the Disposable Heroes of Hiphoprisy than any of the music he's been making the past few years with Spearhead. Franti's more recent songs still have the political fire of his earlier work, but he's found a way to balance rap, rock, reggae, soul and pop into something very much his own. The most recent example is last year's Yell Fire!, a modern, Marley-esque protest album informed by a visit to Iraq. That visit also inspired the documentary film I Know I'm Not Alone. 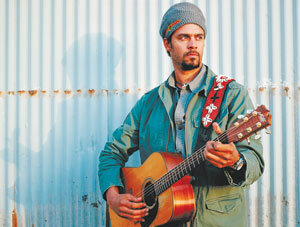 Franti fielded five questions from Chronicle Entertainment Editor Andrew Dansby. 1. Why the title Yell Fire!? There's the old expression, don't yell ``fire!'' in a crowded theater. Don't alarm people unneccessarily and cause panic. There was a fire taking place, and nobody was speaking out about it. It's only been recently that people felt comfortable critiquing war in Iraq ... global warming. 2. Did you go to Iraq planning to come back to the States with a record? No, and I didn't want to make a record where I came back from a trip to the Middle East that was just 14 songs dissing the government. I wanted to make a record that was inspired by the people I met over there. Their endurance. Their desire to move into a place of peace. That came through meeting Iraqi civilians as well as U.S. soldiers. I was really inspired by commitment that a lot of people were showing to help bring an end to conflict over there. 3. Did you go over as part of a USO tour? No, I was just tired of watching the news every night and feeling like I wasn't hearing the whole story. One day I called my manager and said, ``How do you get to Iraq?'' (Laughs.) Turns out all you need is a plane ticket. No special visa. I just wanted to play music on streets for the people, to stand on the street corner and start playing. People would come up and talk. I might've been the first person they met who wasn't holding an M-16. The music was disarming. People would tell me their story, take me into their homes and schools and hospitals. 4. Were there many leftovers from the recording sessions? Yeah, I probably wrote 30 songs. While we were editing footage to make the movie, there were some bottled-up emotions that came out. So I ended up writing more. I've already recorded the next record. And I'm now making an acoustic album. 5. Do you have a specific writing process that works for you? I've never found a great formula that works for me every time. Every time, it's a different process - a phrase that becomes a hook, add a melody, a few chords. The only thing I found that aids in getting the creative flow going is sleep deprivation. When I get tired, I don't censor my thoughts.